An environmental group has warned beachside barbecuers across the north east that an increase in fires being left unattended is a “recipe for disaster”. In south Aberdeenshire, a flurry of blazes at St Cyrus National Nature Reserve in recent weeks has led to calls for visitors to stop lighting fires because current conditions have left the reserve like a tinderbox. And in the north, a beachside community cafe in Balmedie is dealing with the after-effects of disposable barbecues being left while still burning. In one incident at St Cyrus, the fire service was called after a campfire was abandoned near driftwood and dry material and started to spread uncontrollably. A scramble ensued as staff fought to keep it from spreading, using buckets of water and a fire extinguisher until firefighters arrived. Firefighters managed to bring the blaze under control before it became too large to handle. Nobody was injured, but St Cyrus NNR has warned that they may not be so lucky if it happens again. It said the hot weather and increasing frequency of people leaving fires unattended was a “recipe for disaster”. Therese Alampo, SNH reserve manager at the St Cyrus facility, added: “We are currently asking people not to light fires and use barbecues on the reserve at all to help us keep it safe. 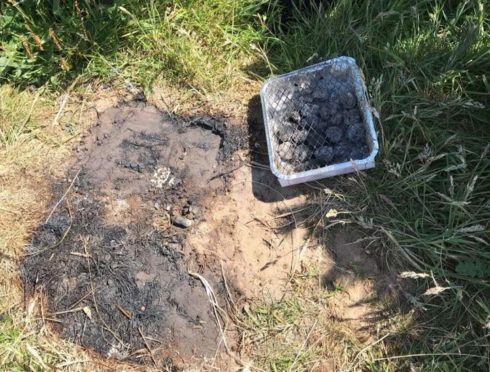 The Sand Bothy community cafe at Balmedie beach has experienced problems with disposable barbecues being left while still burning, scorching the grass underneath, on sites perilously close to gorse bushes. The cafe is having posters made, warning visitors to take home all their rubbish.